Emma Fossard was born circa 1112 at Hutton-Mulgrave, Yorkshire, England.1 She was the daughter of Robert Fossard and Osceria (? 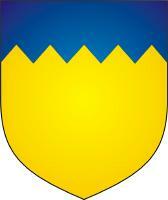 ).1 Emma Fossard married Bertram de Bulmer, son of Aschetil de Bulmer, before 1144. N. N. a mistress of Eustace IV was born circa 1130. She associated with comte de Boulogne Eustace IV de Blois, son of Étienne, roi d' Angleterre and Matilda de Boulogne, after February 1140. Eudon I de Porhoët was born circa 1070?. He married Anne de León. Anne de León b. circa 1080? [S206] With additions and corrections by Walter Lee Sheppard, Jr. and assisted by David Faris Frederick Lewis Weis, Weis: AR 7th ed., Line 39.26. [S1345] Anselme de Sainte-Marie (augustin déchaussé), Pere Anselme's Histoire, 3rd Ed., III:49. Anne de León was born circa 1080?. She married Eudon I de Porhoët. Eudon I de Porhoët b. circa 1070? Unknown mistress of Henry I associated with Henri I "Beauclerc", roi d' Angleterre, son of Guillaume I "le Conquérant", roi d' Angleterre and Queen of England Mathilda van Vlaanderen; Mistress. Maud de Normandie+ b. 1105? [S215] Revised by others later George Edward Cokayne CP, XI:App. D, pg. 106. [S215] Revised by others later George Edward Cokayne CP, XI:App. D, pg. 117. Walter de Belmeis was born circa 1080 at Harrington, North Hampshire, England. Father Ivo de Grentesmesnil, Sheriff of Leicester2 b. circa 1062? Mother Filia de Gant2 b. circa 1072? [S682] D.S.O. Lt.-Col. W. H. Turton, Turton, pg. 100. [S305] John S. Wurts, Magna Charta, pg. 186. [S206] With additions and corrections by Walter Lee Sheppard, Jr. and assisted by David Faris Frederick Lewis Weis, Weis: AR 7th ed., 38-24. [S278] DfAdam, online unknown url, The Line of Harald, King of Dublin, 87. [S1624] Brice" (e-mail address) "Clagett, Somerled's mother-in-law in "Somerled's mother-in-law," newsgroup message 2004-09-28 09:09:25 PST. [S298] HRH Prince Michael of Albany, Albany, pg. 47. [S311] E.Scotland.com, online http://www.electricscotland.com/index.html, Founding of the Clans and the Kings of the Isles. Bernard Balliol was born circa 1075 at Piquigny, France. [S1278] K.S.B. Keats-Rohan, Domesday Descendants, pg. 598. [S215] Revised by others later George Edward Cokayne CP, X:10. [S215] Revised by others later George Edward Cokayne CP, X:11. [S278] DfAdam, online unknown url, The Line of Tadg mac Briain, 113. [S278] DfAdam, online unknown url, The Line of Tadg mac Briain, 112. [S278] DfAdam, online unknown url, The Line of Condla mac Bresail, 116. Ralph Neville, 2nd Earl of Westmoreland was born in 1406. He was the son of Sir John Neville. 2nd Earl of Westmoreland in 1420. Ralph Neville, 2nd Earl of Westmoreland succeeded his grandfather to Westmoreland in 1425. [S693] TH.D. Frederick Lewis Weis, Weis: MC 5th ed., pg. 171. [S1194] Douglas Richardson (e-mail address), Countess Ida Bigod - A Search for Answers in "Countess Ida Bigod," newsgroup message 2002-04-06 13:07:36 PST. [S1194] Douglas Richardson (e-mail address), Countess Ida Bigod - A Search for Answers in "Countess Ida Bigod," newsgroup message 2002-04-06 13:07:36 PST, about 1218. [S682] D.S.O. Lt.-Col. W. H. Turton, Turton, pg. 118. [S1403] Armoriaux, online www.heraldique-europeenne.org/Armoriaux/index.html, Rôle d'armes Glover, 142. Ralph FitzRandolph (Rauf le Fitz Randolf). Alice of Durham was born circa 1070? At Raby, County Durham, England. She was the daughter of Bishop of Durham Walcher of Durham. Alice of Durham married Dolfin fitz Uhtred, son of Uhtred fitz Maldred, before 1135. In 1801, Thomas Philp appeared on the census at Fife, Scotland, Details provided: Should appear in this census. [S22] Scots Origins (published), C, M, 26 SEP 1779, PHILP THOMAS, PHILP WILLIAM, MILLAR JANET, DUNFERMLINE, FIFE, WILLIAM PHILP/JANET MILLAR FR2031 - date is good, naming pattern holds out for father, and same parish as Janet - likely to be my parents..
[S22] Scots Origins (published), OPR C M 26 SEP 1779 PHILP THOMAS PHILP WILLIAM MILLAR JANET DUNFERMLINE FIFE WILLIAM PHILP/JANET MILLAR FR2031 424 7. [S22] Scots Origins (published), Given under seal from the General Register Office, New Register House, 24 Mar 1999, # 9576. [S229] International Genealogical Index (IGI), batch # M100121, dates: 1750-1819, source call # 0102194 (Old Parochial Registers, 1561-1854, Church of Scotland, Parish Church of Dunfermline), type: film, printout call # 6900809. [S413] ., OPR Baptism Record: Philip, Elizabeth: "Tobacco Spinner Pleasance", 15 Mar 2000, Scots Origins. [S414] ., OPR Baptism Record: Philip, William: "Tobacco Spinner on the Pleasince", 15 Mar 2000, Scots Origins. [S415] ., OPR Baptism Record: Philp, John: "Tobacconist", 24 Mar 1999, Scots Origins. [S416] ., OPR Baptism Record: Philip, Andrew: "Tobacconist", 10 Feb 2000, Scots Origins. [S22] Scots Origins (published), OPR C F 15 SEP 1804 PHILIP ELIZABETH PHILIP THOMAS HAMILTON JANET ST CUTHBERT'S EDINBURG MIDLOTHIAN THOMAS PHILIP/JANET HAMILTON FR3552 685 2 63 . [S22] Scots Origins (published), C M 17 MAY 1806 PHILIP WILLIAM PHILIP THOMAS HAMILTON JANET ST CUTHBERT'S EDINBURG MIDLOTHIAN THOMAS PHILIP/JANET HAMILTON FR3603 685 2 63 . [S22] Scots Origins (published), Given under seal from the General Register Office, New Register House, 24 Mar 1999, # 9577. [S229] International Genealogical Index (IGI), batch # 7508621 source call # 0935378 (Patron Sheets, 1960-1991), sheet: 95, type: film. [S229] International Genealogical Index (IGI), batch # 7508621 source call # 0935378 (Patron Sheets, 1960-1991), sheet: 96, type: film. [S22] Scots Origins (published), C F 9 APR 1778 HAMILTON JANET HAMILTON JOHN IRELAND BETTY DUNFERMLINE FIFE JOHN HAMILTON/BETTY IRELAND FR2002 - date is good, naming pattern holds out, and same parish as Thomas - very likely to be my parents..
[S22] Scots Origins (published), C F 9 APR 1778 HAMILTON JANET HAMILTON JOHN IRELAND BETTY DUNFERMLINE FIFE JOHN HAMILTON/BETTY IRELAND FR2002. [S229] International Genealogical Index (IGI), batch # C119496, dates 1771-1784, source call # 1040103, type: film, printout call # 6900808. [S229] International Genealogical Index (IGI), batch # 7406517, source call # 0934352, sheet #19 - Father: John HAMILTON, Mother: Betty GRELAND. [S1032] K.S.B. Keats-Rohan, Domesday People, Alberic de Ver, pg. 131. [S1032] K.S.B. Keats-Rohan, Domesday People, Alberic de Ver, pg. 132. [S603] C.B., LL.D., Ulster King of Arms Sir Bernard Burke, B:xP, pg. 549. [S206] With additions and corrections by Walter Lee Sheppard, Jr. and assisted by David Faris Frederick Lewis Weis, Weis: AR 7th ed., 246-23. [S1345] Anselme de Sainte-Marie (augustin déchaussé), Pere Anselme's Histoire, 3rd Ed., VI:45. [S1345] Anselme de Sainte-Marie (augustin déchaussé), Pere Anselme's Histoire, 3rd Ed., VI:58. [S1345] Anselme de Sainte-Marie (augustin déchaussé), Pere Anselme's Histoire, 3rd Ed., V:507. [S206] With additions and corrections by Walter Lee Sheppard, Jr. and assisted by David Faris Frederick Lewis Weis, Weis: AR 7th ed., 184-2. [S1032] K.S.B. Keats-Rohan, Domesday People, pg. 456. [S1345] Anselme de Sainte-Marie (augustin déchaussé), Pere Anselme's Histoire, 3rd Ed., II:480. [S1278] K.S.B. Keats-Rohan, Domesday Descendants, pg. 400. [S682] D.S.O. Lt.-Col. W. H. Turton, Turton, pg. 82. [S603] C.B., LL.D., Ulster King of Arms Sir Bernard Burke, B:xP, pg. 118. [S693] TH.D. Frederick Lewis Weis, Weis: MC 5th ed., 157-1. [S278] DfAdam, online unknown url, The Line of Geoffrey, Count of Eu, 85. N. N. de Clare was born after 1066. She was the daughter of Richard fitz Gilbert, Justiciar of England and Rohesia Giffard. N. N. de Clare married Walter Tyrol circa 1086. Walter Tyrol was born circa 1066. He married N. N. de Clare, daughter of Richard fitz Gilbert, Justiciar of England and Rohesia Giffard, circa 1086. Walter Tyrol witnessed the death of Guillaume II "le Roux", roi d' Angleterre on 2 August 1100 at England; He was killed while hunting in the New Forest, like his brother Richard, and nephew Henry, before him. Some say he was murdered by Walter Tyrol.1,2,3 Walter Tyrol possibly murdered William, son of William the Conqueror, on 2 August 1100. [S484] Peter Townend, B:P, 105th, pg. li. [S1278] K.S.B. Keats-Rohan, Domesday Descendants, pg. 1104. Also called Robert fitz Walter. Robert fitz Walter de Cheney was born circa 1110. He married Sibyl (?) before 1136. Sibyl (?) was born circa 1113. She married Robert fitz Walter de Cheney before 1136. [S603] C.B., LL.D., Ulster King of Arms Sir Bernard Burke, B:xP, pg. 21. Father Aleaume de Fontaines1 b. circa 1130? Cecily de Fontaine was born circa 1160. She was the daughter of Aleaume de Fontaines and N. N. de St. Valéry.1 Cecily de Fontaine married Hugh de Baliol, Baron of Biwell, son of Eustace de Baliol and Petronille (? ), before 1182. Ranulph I, Vicomte du Bessin was born circa 1015.1 He was the son of Anschitil de Bayeaux.1 Ranulph I, Vicomte du Bessin married Alix de Normandie, daughter of Richard III, duc de Normandie and N. N. , a mistress of Richard III of Normandy, before 1040.1,2 Ranulph I, Vicomte du Bessin was fought at the Battle of Val-es-Dunes in 1047. [S206] With additions and corrections by Walter Lee Sheppard, Jr. and assisted by David Faris Frederick Lewis Weis, Weis: AR 7th ed., 132A-24. [S879] Kevin Miller (e-mail address), RE: Alice of Normandy in "Re: Alice of Normandy," newsgroup message 2001-03-22 22:33:12 PST. [S880] Leo van de Pas (e-mail address), Re: Alice of Normandy in "Pas Re: Alice of Normandy," newsgroup message 2001-03-25 18:26:04 PST, per ES Volume II tafel 79. [S878] Gryphon801 (e-mail address), Alice of Normandy in "Gryphon Re: Alice of Normandy," newsgroup message 2001-03-22 10:34:09 PST. [S1278] K.S.B. Keats-Rohan, Domesday Descendants, pg. 674. Mother Adelise de Tosny b. circa 1025? Lady Alice de Bohun+ b. c 1263? [S206] With additions and corrections by Walter Lee Sheppard, Jr. and assisted by David Faris Frederick Lewis Weis, Weis: AR 7th ed., 68-29. [S215] Revised by others later George Edward Cokayne CP, VI:462. [S1446] Douglas Richardson, "Bohun-Verdun information," e-mail to Robert Brian Stewart P. E., Thursday, March 4, 2004 6:48 PM. John Wesley Smock was born on 28 July 1837 at Indiana. He was the son of Jacob Smock and Frances Ann Colley. [S212] Sue Dugan, "Descendants of Smock & Colley," e-mail to Robert Stewart, 16 Feb 99. [S206] With additions and corrections by Walter Lee Sheppard, Jr. and assisted by David Faris Frederick Lewis Weis, Weis: AR 7th ed., 123-28. [S1265] Genealogy.eu, online genealogy.euweb.cz, de Lusignan 1. [S467] GdRdF, online http://jeanjacques.villemag.free.fr/, Sully. Henry II de Bohun was born in 1200. He was the son of Henry de Bohun, 5th Earl of Hereford, Constable of England and Maud (de Mandeville), Countess of Hereford and Essex. [S206] With additions and corrections by Walter Lee Sheppard, Jr. and assisted by David Faris Frederick Lewis Weis, Weis: AR 7th ed., 237-4, 177-4, 193-4. [S206] With additions and corrections by Walter Lee Sheppard, Jr. and assisted by David Faris Frederick Lewis Weis, Weis: AR 7th ed., 177-3. [S215] Revised by others later George Edward Cokayne CP, VI:452. [S1278] K.S.B. Keats-Rohan, Domesday Descendants, pg. 480. [S215] Revised by others later George Edward Cokayne CP, VI:451-452. [S215] Revised by others later George Edward Cokayne CP, VI:454. [S215] Revised by others later George Edward Cokayne CP, VI:454-455. [S215] Revised by others later George Edward Cokayne CP, VI:456. [S206] With additions and corrections by Walter Lee Sheppard, Jr. and assisted by David Faris Frederick Lewis Weis, Weis: AR 7th ed., 237-5. [S1278] K.S.B. Keats-Rohan, Domesday Descendants, pg. 479. [S215] Revised by others later George Edward Cokayne CP, XII/1, App. L, pg. 47-48 - does not say he did. [S215] Revised by others later George Edward Cokayne CP, VI:451. [S1278] K.S.B. Keats-Rohan, Domesday Descendants, pg. 481. [S1032] K.S.B. Keats-Rohan, Domesday People, pg. 181 (under Durand de Glouuecestre). [S206] With additions and corrections by Walter Lee Sheppard, Jr. and assisted by David Faris Frederick Lewis Weis, Weis: AR 7th ed., 177-2. Geoffrey de Neufmarché was born circa 1040. He married Ada of Hugleville, daughter of Richard FitzGulbert of Hugleville and Papia de Normandie, before 1065. Ada of Hugleville was born circa 1042. She was the daughter of Richard FitzGulbert of Hugleville and Papia de Normandie. Ada of Hugleville married Geoffrey de Neufmarché before 1065. Richard FitzGulbert of Hugleville was born circa 995. He married Papia de Normandie, daughter of Richard I "Sans Peur", Leader of the Normans of Rouen, circa 1022. Papia de Normandie was born before 996. She was the daughter of Richard I "Sans Peur", Leader of the Normans of Rouen.1 Papia de Normandie married Richard FitzGulbert of Hugleville circa 1022. [S206] With additions and corrections by Walter Lee Sheppard, Jr. and assisted by David Faris Frederick Lewis Weis, Weis: AR 7th ed., 177-2, 176-2. [S206] With additions and corrections by Walter Lee Sheppard, Jr. and assisted by David Faris Frederick Lewis Weis, Weis: AR 7th ed., 176A-4. [S298] HRH Prince Michael of Albany, Albany, pg. 45 per the fact that Nesta was daughter of Prince Griffith, son of King Llewelyn..
[S206] With additions and corrections by Walter Lee Sheppard, Jr. and assisted by David Faris Frederick Lewis Weis, Weis: AR 7th ed., 176-1. [S298] HRH Prince Michael of Albany, Albany, pg. 46.